VR Safari is a digital innovation workshop for bold businesses to tap into industry-leading creative insight and hands-on experience with some of the world’s most cutting-edge immersive technology. It’s an opportunity to tap into our network from the likes of BBC, Analog Folk, VR/AR production companies, and other leading figures. It’s a special kind of digital expedition – a guided whistle-stop tour through the HTC Vive, the Virtuali-Tee app, Microsoft’s HoloLens, and Gear VR. Just think of us as the technological David Attenborough. Why might my business need it? If you think your business could use and work with immersive technology, it’s an opportunity to dive into the technology and get hands on. We combine the intellectual and corporate value of facilitated talks with the no-nonsense tangible experience of practical demos. Our tailored workshops and sessions meet your business needs and put you in touch with expert partners in VR/AR/MR industries. 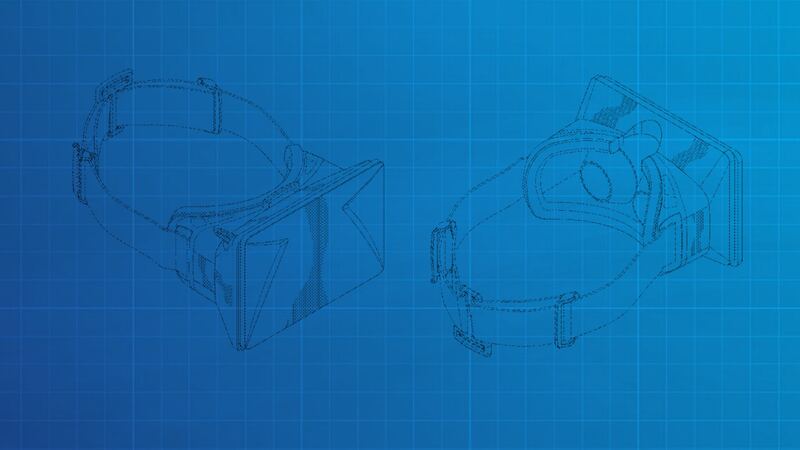 We don’t believe that immersive technology should be limited to just one device or platform, so we showcase a wide variety of wearables and devices across virtual, augmented and mixed realities, and take time to explore the differences between them. You know your business better than anyone, so we take time to learn and understand key parts of your business, and how we can adjust and tailor the learning to deliver results that you want. – The VR industry: where is it now? Here is an example session giving an insight on what you might expect. Our typical day sessions run from 10am until 4pm. 11:15am – Session 2. A member of the Virtual Umbrella team delivers a comprehensive guide to the immersive technology industry and it’s future – looking at the market, revenue projections, and selected case studies. 12:15pm – Q&A. We run a questions-and-answers session with the group (or round table discussion depending on number of guests). 14:00pm – Demos. Our expert team runs hands-on tech demos with the latest hardware; including virtual, augmented and mixed reality, haptic devices and more. 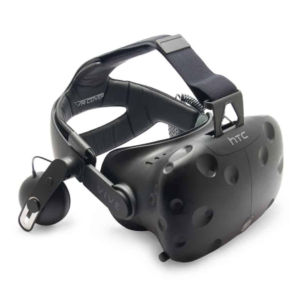 The HTC is arguably the most advanced virtual reality headset currently on the market. Using a mix of Bluetooth and laser tracking technology the headset enables you to walk around in a virtual space of to 5x5m. Users are able to interact with devices, move objects, and complete a whole range of tasks using the intuitive controllers. 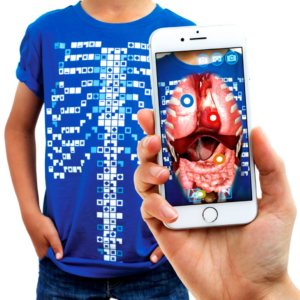 The Virtuali-Tee is an app designed to teach its audience about human anatomy in augmented reality. Using a skeleton-shaped marker, users can explore the human body projected onto a t-shirt. 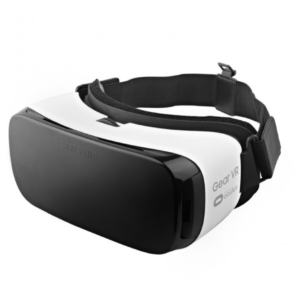 When paired with Google Cardboard or GearVR, the user can even go ‘fully virtual’ and experience a 360 view from inside the human body. 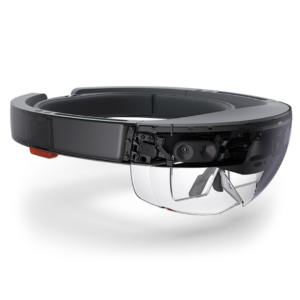 The HoloLens is Microsoft’s flagship immersive technology device. Using hologram technology, the headset is able to project interactive holograms into the room around you. 360 video is one of the most accessible forms of VR on the market, allowing the user to explore a video of an environment in full 360 degrees. It’s not as versatile as other forms of VR as it doesn’t support movement through space, but its simplicity is also its strength. This kind of VR experience is perfect for providing a powerful and thought-provoking snapshot of a place, event, or narrative. I found the presentation and the ability to try out the experience so utterly engaging. I really enjoyed the session and found the team to be incredibly accessible. Thank you so much for taking the time. Very engaging and well-informed presentation , delivered with verve, energy, humour and clearly a passion for the field […] I found it all very interesting. Well done! Really excellent presentations, right mix of content and commercial angle, all done with great personality.